Electric buses offer quiet, peaceful, and fresh-smelling commutes for riders. Sounds pleasant, right? In a previous blog, I highlighted the benefits of electric buses. They’re less polluting no matter where they operate, are more comfortable to ride in, cheaper to run, and can be powered by renewable energy. No wonder Wisconsin cities like Madison, Milwaukee, and Racine will see electric buses on their streets soon. These cities will be the first in Wisconsin to benefit from electric transit buses, but hopefully not the last. Medellín, Columbia will get 64 electric buses in August. 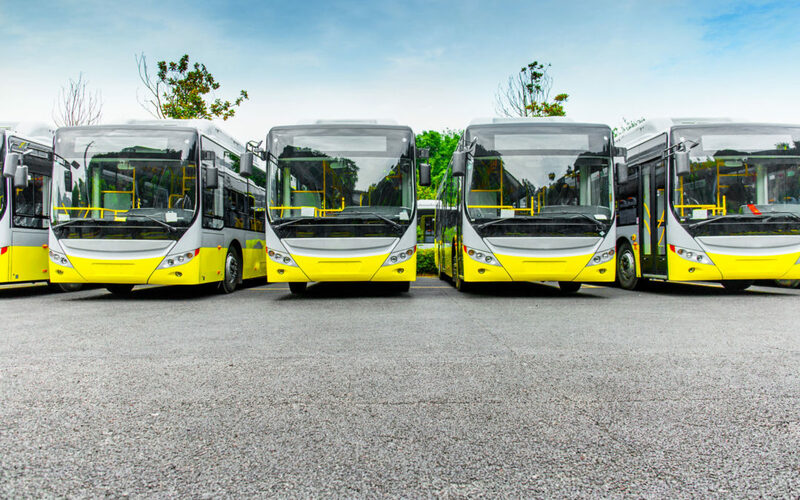 Moscow, Russia recently purchased 200 electric buses, some of which have been operating since last fall. Shenzhen, China has only electric buses. 16,000 of them. Medellín and Moscow, Santiago and Shenzhen. While these cities are very different than Eau Claire or Green Bay, they show that electric buses make sense in locations around the world. And if they can do it, why can’t we? Why aren’t all buses electric? In short, the price tag. An electric bus costs almost twice as much as a diesel bus upfront, although they do save money in the long run on fuel and maintenance costs. But, since transit authorities operate with tight budgets, it’s often not feasible to prioritize electric buses unless we use creative financing methods to get electric buses for the same price as diesel buses. We have solutions that can reduce the upfront cost barrier, save the bus owner money, and maximize the benefits that electric buses afford cities. It’s called Pay As You Save®, or PAYS®. PAYS allows the transit operator to purchase an electric bus with an investment from their utility, which the utility recovers over time through a fixed charge on the transit operator’s utility bill. PAYS is a win, win, win solution that puts more electric buses on the road. The transit operator saves money each month thanks to those reduced fuel and maintenance expenses, even with the additional monthly charge. The utility makes money by selling more electricity, and we all benefit from less exposure to air pollution. For more information about how PAYS works in practice, visit Clean Energy Works and watch their video above. Electric bus manufacturer Proterra announced this week that they are scaling up their battery leasing program. Proterra’s program leases the bus battery to the customer, which brings the upfront cost of the bus down. Much like PAYS, the Proterra program aims to accelerate electric bus adoption by allowing transit operators to buy an electric bus for about the same price as a diesel bus. Operating funds that would have been spent on diesel fuel instead go toward the lease payment, leaving a little extra for savings. Buses last a long time. It’s important to start the transition now because any bus that hits the road now will likely last into the 2030s. But it doesn’t have to be that way. Electric buses benefit the transit operator, riders, utilities, and citizens. Wisconsin has already started the transition to electric. Now is the time to speed it up by using these creative, proven financing models that are a win, win, win for Wisconsin. When I left for Michigan last Friday, I was not expecting my electric vehicle advocates meeting to remind me how important trucks are to American culture. 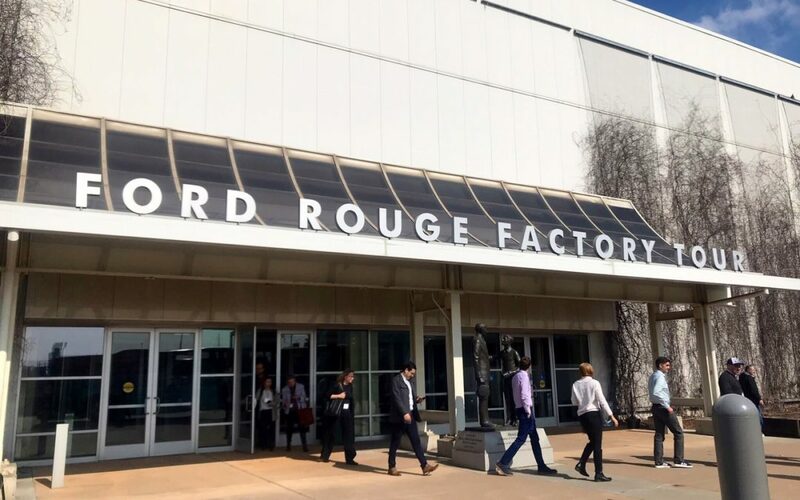 The conference provided the opportunity to tour the Ford Rouge Factory and Rivian, the new “electric adventure vehicle” maker. Funnily enough, both experiences centered around pickup trucks. 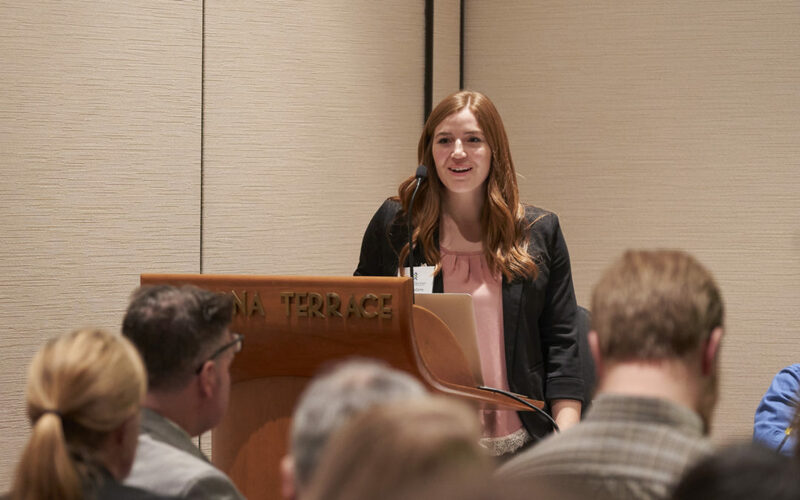 On the surface, trucks don’t exactly seem like the electric vehicle advocate’s dream, but perhaps we needed this conversation to help us think about really reaching the masses with electric vehicles. The Ford Rouge Factory produces the iconic F-150. No photos during the tour were allowed, so I can’t share too much, other than that it was a fascinating experience to see the manufacturing facility in full swing. Workers literally put trucks together while we watched. Someone on the tour with me described it as “a ballet” of workers and machinery, each going at the exact correct pace to keep up with the production schedule and snap vehicles together seamlessly. What struck me was the size of the vehicles. On the day we went, the factory produced extended cab trucks. They were giant! It was amazing to watch these cars roll off the line (every 53 seconds!). I highly recommend visiting Rouge Factory if you find yourself in Southeast Michigan. In January, Ford announced plans to make an electric version of the F-150. I don’t know when or where yet, but I hope I’ll have the opportunity to tour the factory where electric F-150s are produced, too. Rivian is a start-up company that is developing “the world’s first electric adventure vehicles.” In February, Rivian announced a $700 million investment round, led by Amazon. They are working on a pickup truck and an SUV that are capable of taking you from the coast to the mountains and back on a single charge. Rivian’s cars look cool and have practical additions like the “gear tunnel” to give you even more space to store your adventure gear. The first Rivian vehicle will be the R1T, an electric pickup truck. It’s expected to hit production in late 2020. Coincidentally, Rivian is testing its truck’s performance with a car that’s disguised as an F-150. There aren’t any ties between the two automakers, Rivian just wants to test their technology without gaining attention, and the F-150 cab allows them to do just that. Rivian’s Headquarters is in Plymouth, Michigan. You may remember from a previous blog that I grew up in Metro-Detroit – I actually went to Plymouth High School. It’s so fun to go home and see new companies combing transportation and technology in my old stomping grounds. In other electric pickup truck news, Tesla is teasing a new model as well. Lesser known companies Bollinger and Atlis are also both expected to drop new electric pickup trucks soon. It’s an exciting time for the auto industry and electric vehicle advocates. I think these tours highlight that the transportation landscape, and the conversation, is changing in ways we didn’t expect. Drivers want electric trucks, and manufacturers want to provide them. The surge in electric pickup truck options is evidence that electric vehicles aren’t just for the sedan-driving eco-minded consumer, they’re for everyone. For more info on the number of electric vehicle options available soon, check out our infographic, Electric Vehicle Market Outlook. Last fall, I wrote a blog about the Volkswagen Mitigation Settlement, A Big Opportunity for Electric Vehicles. The Federal Volkswagen Mitigation Trust awarded Wisconsin $67.1 million to replace aging diesel vehicles. The goal of the settlement is to counteract the damage done while over-polluting Volkswagen cars were in operation. Wisconsin’s plan for spending approximately two-thirds of the funding, or $42 million, included replacing transit buses and state fleet vehicles. Now, it’s time to decide what to do the last third of that funding, about $25 million. 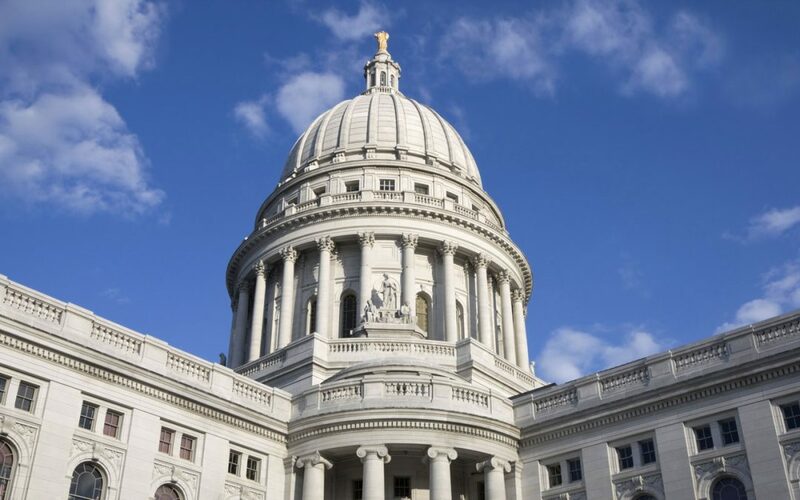 Governor Evers released his State of Wisconsin Budget in Brief last Thursday. Good news! 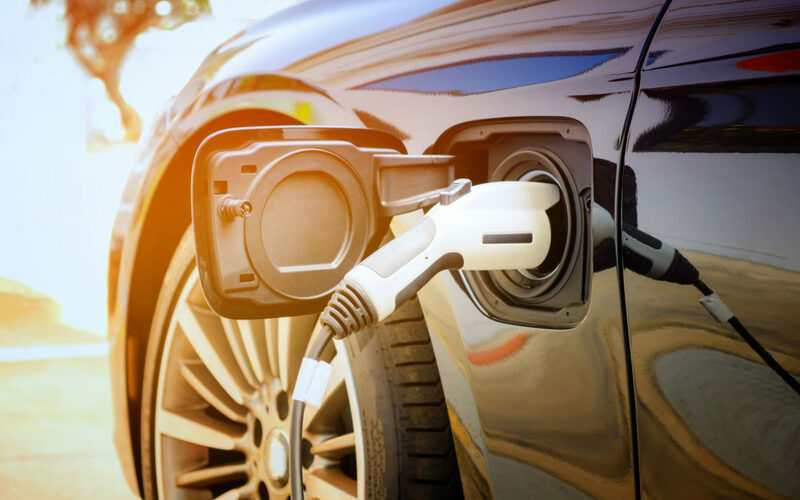 It included an allocation for the rest of Volkswagen Settlement funding, with a specific call-out for $10 million to fund electric vehicle charging infrastructure in Wisconsin. The budget calls for the $10 million to be administered as a grant program by the Department of Administration. This is a big win. Per the settlement terms, states are allowed to use up to 15% of their funding to pay for electric vehicle infrastructure, which comes to just about $10 million in Wisconsin. Taking full advantage of this opportunity means Wisconsin drivers can drive with the confidence that they can recharge in public if they need to. This funding will go a long way to support a vast network of fast recharging stations across the entire state. The rest of the funding, $15 million, was earmarked for more transit bus replacements. Our hope is that these buses will be electric. Electric buses are so much cheaper to operate, more efficient, and produce zero point-source pollution, making them a “win” for everyone. Before these Volkswagen allocations can be spent, the budget needs to pass through the legislature. While there is a chance that this budget will not pass, I am really excited to see a commitment to electric transportation. If this commitment makes it through the legislature, Wisconsin will join 44 other states that have also pledged to take advantage of this opportunity. It’s a long road to ensure every Wisconsinite has access to affordable and clean transportation. This is a big step on that journey. Stay tuned for more details as we continue to follow the Volkswagen Mitigation Settlement and advocate for using Wisconsin’s funds to advance electric transportation. RENEW Wisconsin Electric Vehicle Blog: We have *electric* liftoff! I met Scott Manley at a National Drive Electric Week event back in September, at a Ride-n-Drive that featured his Tesla Model X. Scott’s Tesla caught my eye, but after talking with him for a few minutes, I realized that owning a Tesla was far from the most interesting thing about Scott. Scott is a pilot and his personal aircraft is special in that it is an electrically self-launching glider. Pure gliders don’t have a propulsion system. Instead, they are typically pulled into the air by a powered airplane until they’re high enough to reach a source of rising air. Much like hawks, gliders then stay aloft using that rising air. Scott’s glider has an electric motor, which means it doesn’t need to be towed into the air. His glider is capable of taking off under its own power and climbing into the rising air. Once there, the motor is shut down, the propeller blades fold against the side of the glider, and the flight continues, often for hours at a time, using only the energy in the atmosphere; free, clean energy generated by the sun heating the ground. 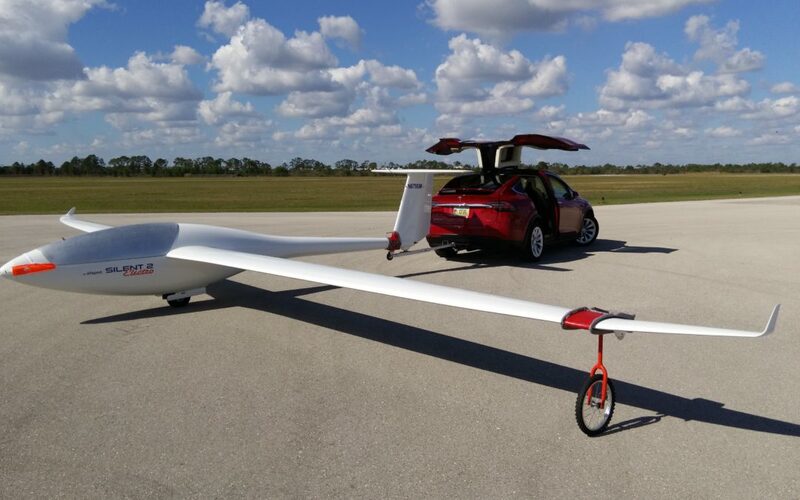 The image above shows the Tesla Model X ready to tow Scott’s Alisport Silent 2 Electro out to the launch area. The beautiful cumulus clouds in the background are each the result of a rising column of air. Way cool. Scott is also an F.A.A. (Federal Aviation Administration) certificated glider flight instructor providing both aircraft-based and simulation-based flight training at-a-distance (via the Internet) to glider rating candidates nationwide. Learn more about him at gliderCFI.com.